I like a party where people of all ages can relax and have a good time, including the hosts. And I really really really enjoy hosting just such a party. The planning! The feeding! The mingling! The half-finished conversations and the help with the dishes! My planning basics are: who, when, food, beverages, activities, seating. I'm fond of a good to-do list. If all the thinking and preparation is completed before the guests arrive, you can just let events unfold in a lovely swirl around you. 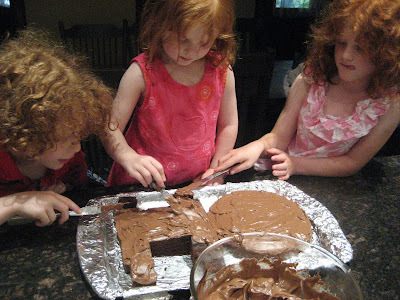 Herein, a few recipes and photographs to document Fooey's fourth birthday party: nine children, eleven adults, zero injuries. Yesterday morning, I started cooking a giant pot of black beans (from Nina's buying club). About an hour before the guests were due to arrive, I started a large pot of white rice. Meanwhile, I was also frying up two generous pounds of hamburger (Nina's buying club, again). 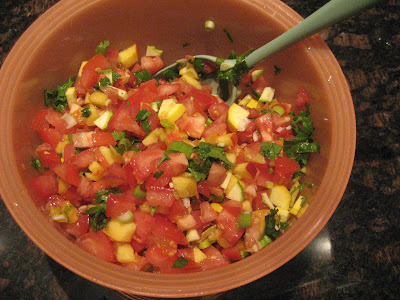 Finally, I made a fresh tomato-peach salsa, which involved a lot of chopping. The basic meal at the end of these simple recipes is served buffet-style, starting with a bowl of fresh flour tortillas (Nina's, again! ), and continuing in the following order: rice, beans, hamburger, grated cheese, chopped lettuce, feta cheese, sour cream, fresh tomato-peach salsa, hot sauce, and, finally, a giant bowl of tortilla chips for crumbling atop everything else. You can add or subtract as your own tastes desire. Now, the cake. 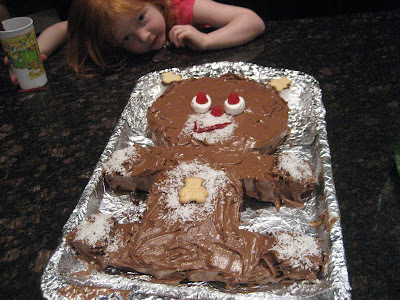 This "bear cake" has become a family tradition, in part because it's ridiculously easy to make and always ends up looking, well, cute. The older children no longer request it, I must add. 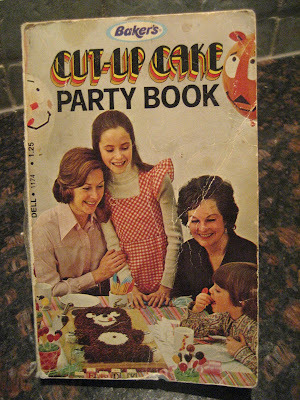 The design comes from a book that, as children, my brothers and sister and I used to drool and fantasize over, titled "The Cut-Up Cake Party Book," published in 1973. 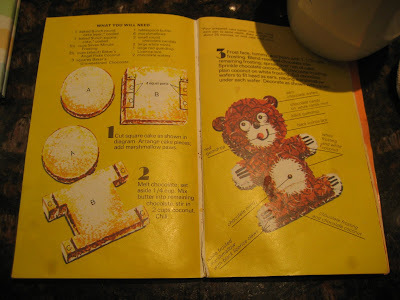 The authors were fond of dyed flaked coconut, and the themed party, but their bear cake design is unbeatable: bake your cakes in one square pan and one round pan, use the round cake for the head, cut a few squares out of the other cake, and, voila, teddy bear's body with paws! Frost and decorate. 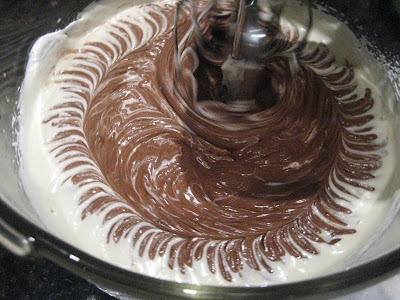 Okay, deep breath ... here's today's confession: I use a boxed cake mix to make our birthday cakes. There, I've said it outloud! Aagh! But here's why: because I used to go to a lot of fuss and bother to bake cakes for my children's birthday parties and they weren't measurably better than this boxed brand I discovered a few years back. It's made by Dr. Oetker with a short list of organic ingredients, all of which I've heard of and which do belong in cake. I add the eggs, milk (soy milk in this case) and oil. 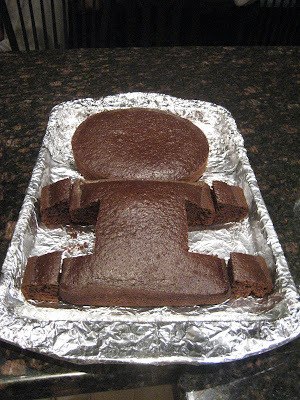 I'm not claiming it's the best cake ever, but it's easy to handle, pops out of the pan, and is reliably tasty. The same cannot be said for storebought frosting, however, so, this birthday, inspired by eating a gigantic slice of my friend Nath's crazily delectable chocolate cake, I requested and prepared her Swiss Meringue Buttercream, from a Martha Stewart recipe. She claimed it was not that complicated. I'd say we have different definitions of complicated; but nevertheless it turned out so beautifully and spread so smoothly and tasted so rich that I will absolutely be making it again. To save time, and typing, and because it is not in any way a "mini-"anything, I'll refer you to Nath's blog for the recipe, with these words of caution: one and a half cups of butter. One final recipe ... because this was a summertime party, with lots of adults as well as children, Kevin devised a lime-green rum punch, stirred up in a large glass container and served, upon arrival and throughout the evening, to those guests old enough to appreciate it. Stir it up. The party's started.